AS-OBGYN™ delivers state-of-the-art ultrasound reporting and image management designed for women's healthcare and tailored for Maternal Fetal Medicine (MFM). It is a scalable and robust solution utilizing a structured, clinical database to efficiently manage ultrasound information. AS-OBGYN is designed to be intuitive and easy to use. The integrated image management solution allows you to finalize your reports with embedded images in seconds. AS-OBGYN is vendor neutral and compatible with all ultrasound equipment manufacturers. AS-OBGYN seamlessly integrates with your health information systems (e.g., HIS, RIS, PACS, EHR and EMR) to enable interoperability across platforms. AS-OBGYN will provide you with the tools to perform intelligent data mining and statistical analysis to support your practice management, accreditation reviews, academic presentations and research. AS-OBGYN is FDA 510(k) approved and compliant with HIPAA Privacy & Security requirements. AS-OBGYN will streamline your ultrasound reporting and image management workflows to maximize productivity and enhance patient care to deal with today's healthcare challenges. AS-OBGYN offers an intuitive user interface that is both logical and simple to use. You do not have to be computer literate to use and administer the AS-OBGYN system. Generate comprehensive, structured reports without endlessly toggling and jumping between multiple windows. Review reports in an easy-to-read, structured format that is linked directly to the ultrasound images for reviewing in high resolution DICOM format. Our User Interface will allow you to easily compare today’s images with previous studies as well as previous pregnancies. Embed your selected images and finalize your reports with just a few clicks of a mouse. AS-OBGYN will streamline your operations, reduce users’ learning curves, simplify administration, and minimize system maintenance. AS-OBGYN is a configurable solution to efficiently manage ultrasound reports and images that emulates the workflow of OB/GYN and MFM practices. 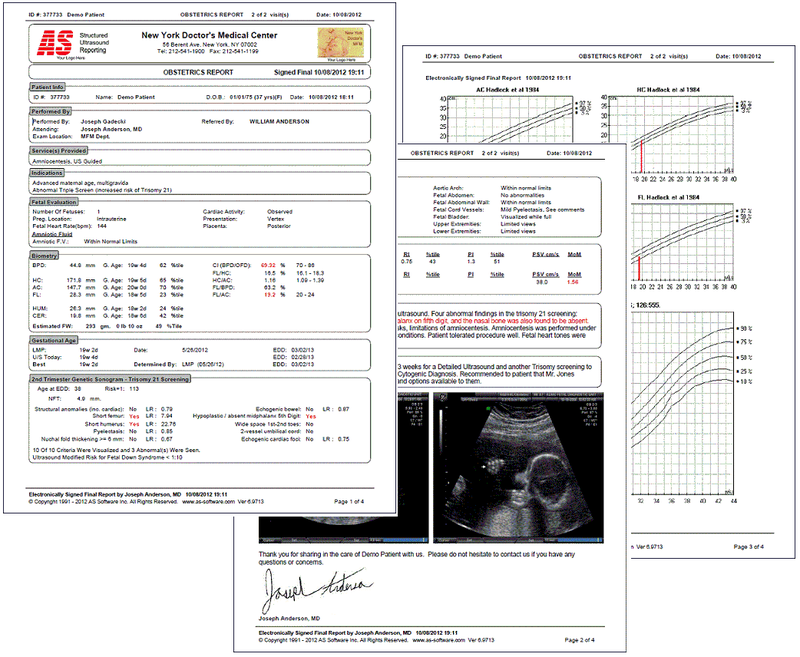 Our technology will enable you to: configure default values and define your standard terminology throughout the system; define protocols for normal and abnormal findings; use your preferred references for calculating Trisomy 21, normal ranges and percentiles for Biometry and Dopplers; automatically generate impressions, recommendations and consultation letters utilizing pre-defined templates and built-in macros that correctly format your current exam findings. AS-OBGYN provides the tools to streamline the management of your ultrasound information and images. AS-OBGYN will enable you to remotely review, modify, and electronically sign your finalized ultrasound reports. AS-OBGYN will enable you to automatically fax your report, including embedded images and growth analysis charts, to your referring physicians, while simultaneously transmitting a copy to your healthcare information systems (e.g., HIS, RIS, PACS, EHR and EMR) for storage. AS-OBGYN enables you to create comprehensive, structured ultrasound reports and consultation letters in seconds. By communicating directly with your ultrasound modalities, AS-OBGYN will automatically transfer measurements for inclusion in your finished report. In addition, AS-OBGYN will automatically incorporate CPT and ICD codes when you document procedures, indications, and diagnoses. Use AS-OBGYN to quickly generate professional reports with embedded growth analysis charts and ultrasound images. Electronically sign and automatically distribute your finalized ultrasound reports to your referring physicians and designated health information systems. AS-OBGYN is your tool to create comprehensive ultrasound reports in seconds and provide proper documentation to protect your practice and increase your reimbursements. AS-OBGYN is built on a robust, relational SQL database and provides the tools necessary for intelligent data mining and statistical analysis in support of your practice management, accreditation reviews, and research & publication projects. Use the statistical summaries module for your daily administrative reporting needs. Use our "Friendly Query Builder" to easily extract your data without being an expert in computer programming and database structures. AS-OBGYN comes packaged with a comprehensive library of hundreds of pre-defined, custom reports to help you analyze your data. Our export module allows you to export your data to other systems (e.g., Access®, Excel®, Crystal® reports, or PowerPoint®). AS-OBGYN has been developed to be a scalable and robust solution with integrated DICOM image management to satisfy the needs of OB/GYN and MFM practices. We provide ultrasound reporting and image management solutions to a wide variety of organizations. It does not matter if you are a small to mid-sized single office practice, a multi-site facility, or a complex healthcare enterprise with OB/GYN & MFM units located in multiple sites, our solution is designed to integrate with your healthcare information systems, interface with your ultrasound modalities, and scale with your organizational needs. AS Software collaborates with its clients and continually to invest in the development of solutions to meet the changing needs of today's healthcare professionals. AS-OBGYN is a configurable solution to meet your organization's need for interoperability. Our technology integrates seamlessly with your healthcare information systems to exchange information across platforms (e.g., HIS, RIS, PACS, EHR and EMR). Use it as a stand-alone solution or fully integrate with your hospital or enterprise systems. We have extensive experience building complex, vendor-neutral interfaces. Unlike other software providers, our in-house expertise allows us to build, deliver and maintain our own interfaces that are scalable, robust and compliant with DICOM & HL7 standards. Our staff of skilled technical engineers is available to configure, implement and provide support for our applications and interfaces, eliminating the need to deal with multiple vendors. AS-OBGYN provides the tools for seamless PACS integration and efficient ultrasound image storage. Seamlessly integrate via API/XML plug-ins, DICOM query and DICOM send. The integrated AS-IMAGE™ module will automate your image archival needs. This completely configurable system allows you to efficiently manage short-term storage utilizing local storage, NAS, or SAN, and long-term storage utilizing your hospital or enterprise PACS. AS-OBGYN is vendor neutral and compatible with all ultrasound equipment manufacturers. It is fully DICOM compliant and supports single-frame, cine loops and 3D/4D/5D volumes. Use DICOM modality work lists to upload scheduled patient data to your ultrasound machine. Automatically download ultrasound measurements via DICOM-SR or offline serial/parallel/USB communication. AS-OBGYN provides a fully integrated solution that streamlines data entry and reduces errors.